I’m not sure how or why the Holy Spirit impresses a particular passage of Scripture on my heart in certain seasons of my life, but He does. Perhaps you also have had this experience. You may have been thinking, praying, reflecting, wondering, listening, waiting before the Lord and then, quite out of nowhere, it seems, you were somehow drawn to a text. You were not, in the moment, at least, exactly sure why. But then, as time marched on, the text consumed you. You found yourself reading it and reading it again. Over and over. It became like a well: deep, inexhaustible, fresh; the passage became a fountain from which you drank as if lost in a desert; it quenched your thirst and, at the same time, made you thirsty for more. It breathed life. This, too, has been my experience over time. Early in my assignment as general director of Church of God Ministries, I found myself staring at John 10. I honestly don’t how I landed there. I was just waiting on the Lord, seeking His presence and perspective, as I opened my Bible; John 10 appeared. The page opened to the first verse and the rest of the chapter that follows. I was no stranger to the text; it is a passage read more times than I can remember. But, in a strange and magnetic way, the words began to jump and wave from the page. They called to me, demanding my attention, whetting my appetite for more, feeding my thirst while, at the same time, satisfying it. Sheep, shepherds, pastoral scenes are all familiar metaphors outlining our spiritual journey. In John 10, Jesus paints vivid portraits of life—both its dangers and its promises—using this imagery. At first glance I thought it familiar stuff and yet it also was strangely new. It is still, four years on, stoking the fires of my heart, of my hopes, and of my confidence in the providential destiny of this Movement. In John 10, Jesus is pressed to identify Himself: “If you are the Messiah, tell us plainly” (verse 24). Jesus quips back, “I have already told you, but you don’t believe Me. The works I do in My Father’s name testify about Me” (verse 25). The crowd is displeased and seek to stone Him. “I have shown you many good works from the Father,” Jesus replies, as his audience prepares to do Him harm, “for which one of these good deeds are you killing Me?” (verse 32). In this exchange, Jesus makes clear that His own witness and testimony are inextricably linked to His good works, His “good deeds.” They are the proof of His calling and divinity. Lots to think about there, as I follow Him. Yes, Jesus is the subject. It is John 10:10, though—perhaps, the most famous verse in the mix—that whispered and then shouted the key to the whole: “The thief’s purpose is to steal and kill and destroy. My purpose is to give life in all its fullness” (tlb). Jesus did not come to give us church more abundantly. He did not come to give us more to worry about. He did not come to make things more complicated. He did not come to give us more doubt and fear. He came to give us life. As a Movement, the Church of God has been wrestling with its identity in the last quarter century and, in some quarters, before that. Our “sense of self” has wandered from here to there. Some neighborhoods of the church have embraced certain historic truths as our defining markers, others have been enthused about other emphases. Common language and purpose have been lost as national, church-wide publications have closed, as the hymnal (which was a storehouse of phrases and ideas that once bound us together) has fallen out of favor in many pew racks, as pastors and local shepherds have found their education and resourcing in the broader Body of Christ, apart from our historic institutions, and as the exponential development of technology and media streams has informed our church family from a thousand angles heretofore never imagined. Maintaining any kind of cohesion and group identity requires some common language and purpose. In a Movement without fixed books of discipline, enforceable doctrinal statements, or strong structural ties, we, more than most in the Christian family, are united by common core language and purpose. Each local church finds its way in its local context but, as part of a larger church family, united by broad themes and biblically grounded ideas. Of course, every soul won to Christ is a win, taking back someone made in the image of God from the “kingdom of darkness” into the “kingdom of light” (as Paul articulated his calling in Acts 26). Every time justice prevails where injustice has reigned, heaven wins and hell loses. Every time what is broken is mended and made whole, heaven wins and hell loses. And so on. Calibrating ministry in this way echoes the “good deeds” that bear witness to the authenticity of Jesus’ messianic mantle and helps us walk in His footsteps. It is distinguishing language, altogether congruent with our holiness roots and reliance on the Holy Spirit, who empowers us to live up to the ministry of Christ (as in Luke 4:16–22 and repeated in our General Assembly’s constitution: “The Spirit of the Lord God is upon Me, to…”). This common language allows every local church to, at once, customize its ministry, as the Spirit leads while, at the same time, unite us with the larger Church of God family. Unity and holiness are watchwords in the same way. Be Bold has become a moniker, too. Our five Regional Conventions in 2018 will pick up this baton and help us go farther. Drawing from John 10, we will talk about giving life: Receive Life. Hear Life. Embrace Life. Can we be the Movement that is known for giving life? Can we make Jesus the subject, take back what hell has stolen, and be bold all at once by giving life? Have you ever walked into a room that drains life, a room in which you feel pre-judged, distanced, set apart, uncertain of your welcome? Have you ever walked into a church meeting like that? A meet-up with other believers? Hmmm. Sad to say, I have. I’m guessing you have, as well. I’ve learned to dread—and, if possible, avoid—such venues. That’s human nature, I suppose. But, there are places and people that give me life, like Jesus does. They do so not by commiserating about the faults and failures of others, they don’t nourish relationships with dark edges of gossip or judgement, but they call the best out of me. They reassure me of the Lord’s living presence, His hope, His smile, His irresistible holiness, and His promises. I want to be a part of and in lock-step with them. That’s the Church of God I see and want to believe can be. Giving life. We first must receive life ourselves, before we can share it. We must hear life before we can speak it. We must embrace life before we can model it. Our five Regional Conventions this year will all be packed with great teaching, relationships, and hands-on opportunities to Give Life. Participating in one or more of these meetings is more than just about you and your life, though—it strengthens the whole church. It’s about how you give life, too. If we do not meet, from time to time, common language and purpose will be further eroded. The Movement needs you—and it needs your pastor—to be present. To receive. To hear. To embrace. All are welcome. 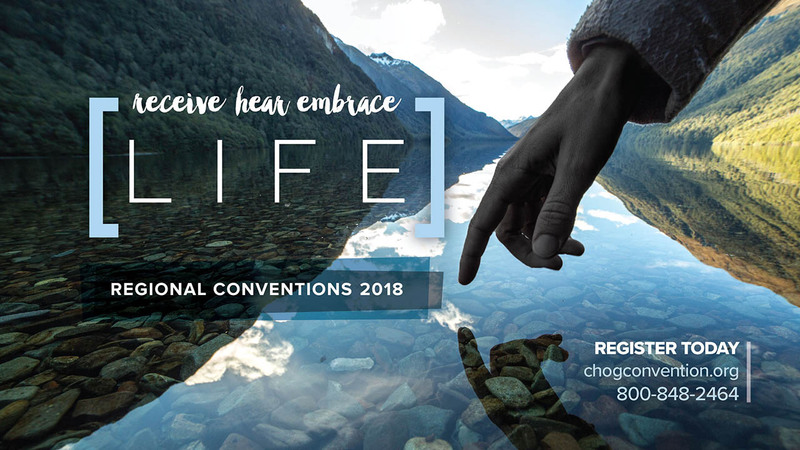 There are some speakers and program pieces that will be uniform across all five conventions—and each convention will also have its own unique regional draws. The five outstanding local church ministries hosting the conventions in Phoenix, Oklahoma City, Columbus, Fairfax (Washington, D.C.), and Safety Harbor (Tampa) will each staff conferences in their location sharing their best practices and messaging. Top-tier Bible teachers from within the Movement and beyond will be on deck, inspiring and stretching everyone in the house, for the good. Relational networks across the Movement will be enhanced and new ones formed. A Town Hall will allow you to ask questions and get the latest news about developments across the Movement in the USA and Canada and in ninety-two other nations, as well. Join the Movement. Find some common language. Think about purpose. Get in touch. Help your congregation know it is not alone, but a part of a sweeping new day called the Church of God. Receive Life. Hear Life. Embrace Life. You can, at the five Regionals in 2018. I am so looking forward to seeing you there. And, I’m reading still John 10. Join me.